Volunteers have been steadily working the past three weeks stabilizing the inmate built terraces on the west side of the island. 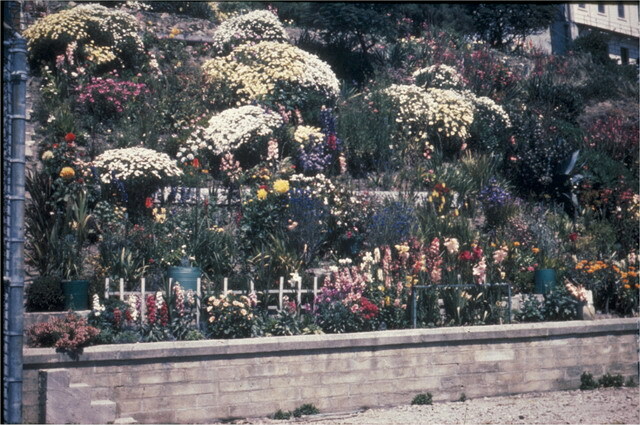 The garden area referred to as the laundry terraces, was developed and tended by penitentiary inmates after the 1930s and was cared for until the maximum prison closed in 1963. 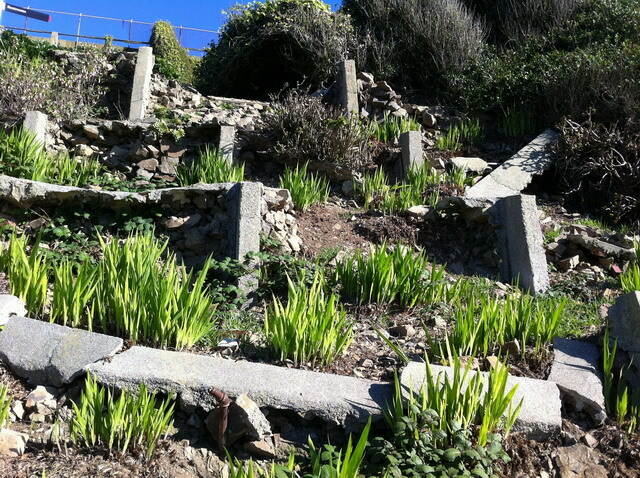 The original terraces are still standing and survivor plants dot the terraced hillside. However, the terraces and the access stairs are in need of repair. and mason, all repairs done to the terraces must match the existing historic materials. 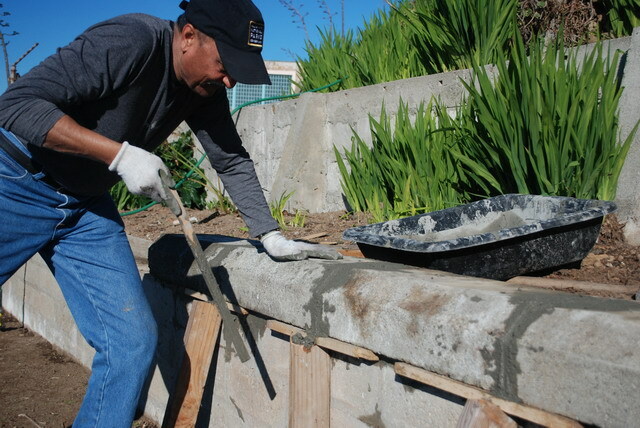 Most significantly, the mortar that we use to cement the concrete blocks back together must be accurate. 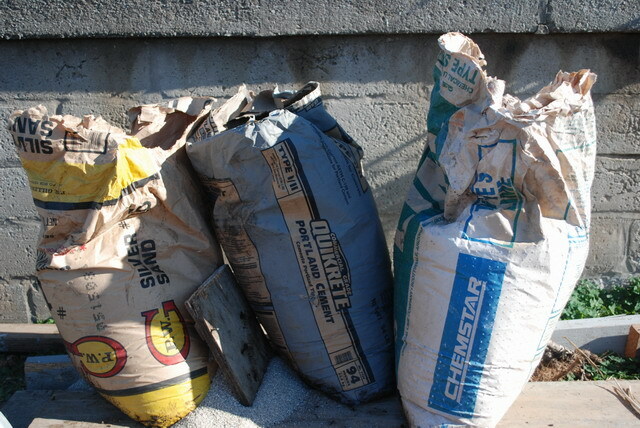 For this, we mix the mortar using a ratio of 8 parts sand to 2 parts Type 2 Portland cement to 1 part lime. The volunteers love this part of the Alcatraz experience. One of my long-time volunteers explains that to be a gardener out here, you are also a carpenter, a mason and a plumber. These historic terraces are closed for public accessed and we are only able to work in this area from September to February. A large colony of Brandt’s cormorants call this area home the other months of the year and this vital nesting site would be disturbed. Still, it is important not to allow these terraces to further degrade and we will be working diligently over the next few years to make the necessary repairs. Interestingly, a volunteer group, the Bay Area Whaleboat Association, weeded the terraces December 10 and uncovered never seen before inmate graffiti. 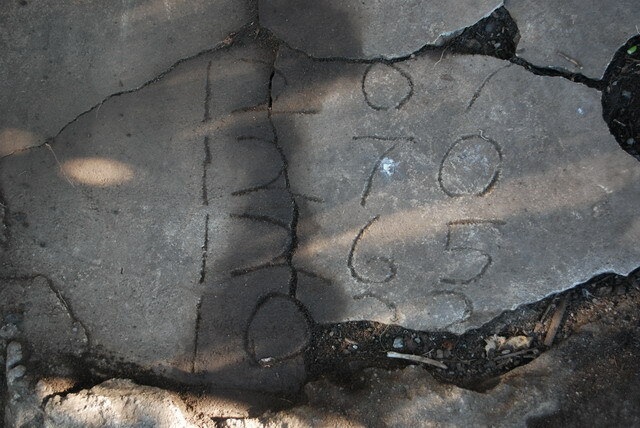 They found numbers etched into cement that formed a basin underneath a spigot – perhaps the numbers correspond to inmates that did work in this garden area? The Federal inmate records held at the National Archives in San Bruno will hopefully yield some answers. Carola Ashford, the garden’s first project manager, described the garden work as “garden archeology”. And, it certainly is. The garden restoration is about to enter its ninth year and we are still discovering the gardens. This entry was posted in Artifact, History, Inmate Gardeners, Rehabilitation, Volunteers. Bookmark the permalink.